The Week in HD - Monday 17th September | What Hi-Fi? Welcome to The Week in HD - our weekly guide to the best high-definition TV shows, films, sports and Blu-ray releases tog race your shiny screens. Superheroes Captain America, Iron Man, Hawk Eye, Black Widow, The Hulk and Thor are all reluctantly recruited by Nick Fury's SHIELD to stop trickster god Loki from taking over the world with scaly aliens. With a star-studded cast of Chris Evans, Robert Downey Jr, Jeremy Renner, Scarlet Johansson, Mark Ruffalo, Chris Hemsworth, Samuel L Jackson and Tom Hiddleston – and a fantastic script from Buffy and Firefly creator Joss Whedon – this is one hell of a film. Also: Agent Coulson is the best. After five tough weeks, the final week of Celebrity MasterChef is finally here, with the original 16 whittled down to the last three. Tonight's an exciting challenge: invent a brand new dish around an every day chicken, and then cater lunch to the 90+ cast and crew of BBC's own New Tricks drama. One day, there's be a red button option where we can actually taste the scrumptious cakes concocted by all these baking contestants. Tonight, it's Queen of Bakes Mary Berry's turn to throw down a technical challenge in the form of a pudding, while the strudel showstopper will eliminate another baker from their midst. Sadly, I've been missing out on the Luther re-watch, but tonight's episode is bound to be a must-see. As Luther goes on the run after being suspected of murder, he enlists Alice's help to prove his innocence...while also exacting revenge on the real killer. Starring Idris Elba and Ruth Wilson. It's Alex Kingston's turn tonight, (better known to us as River Song from Doctor Who), and she explores three strands of discovery in this episode: her great-grandfather's pre-first-war career as a photographer, the possibility of a Jewish ancestry, and a remarkable four-times great grandmother who took an unconventional enterprise to avoid poverty. Demons. Now this is a good one. Castle and Beckett investigate the murder of a paranormal investigator in a supposedly haunted mansion – expect plenty of tongue-in-cheek tropes and spooky hilarity. The UK title is Marvel Avengers Assemble, but as it's a silly name I've decided to ignore it. 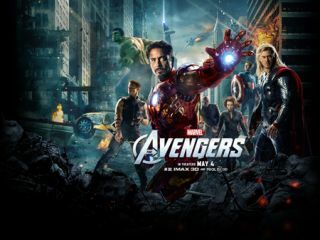 The superhero event of the year (sorry Batman and Spidey), this much-anticipated film of squabbling superheroes provides action scenes and laughs aplenty, thanks to the greatest TV writer of all time: Joss Whedon. And yes, it is worth watching in 3D. It's the final. I have no idea who the three finalists are, but who cares since we'll all be looking at the food anyway. And considering their final test will be cooking the ultimate meal for the judges, let's hope they make the sweetest desserts, just for Greg Wallace's expressions of delight. Last week upped the love-triangle story amidst the bleakness of war – and the final installment of this gorgeous period drama most certainly won't hold back the emotional punches. While Christopher is sent to the Front with two fellow officers who despise him, Valentine pines and waits for him back home, but restless Sylvia is determined to make one final play for Christopher's affections. I'll be sad to see this series end and I'm tempted to tackle the massive original book just to get more of the characters' layered complexities. The cinematography and costumes were beautiful, but it would've been nothing without the superb actors: while Benedict Cumberbatch is sublime as usual, if Rebecca Hall doesn't get a Bafta for this, I'll eat my very fine hat. Jam, Jelly and Juice. It's great to have QI back on our screens. If you haven't seen last week's opening episode, head to BBCiPlayer for a half hour of silly hilarity. Tonight, Sue Perkins, Liza Tarbuck and Jo Brand join the boys for a jam-packed session. Skyfall is on its way in October, but I still love Daniel Craig's first outing as James Bond. Poker in a Montenegro casino, a great villain in Le Chiffre, riveting action scenes peppered with witty retorts from both M (Judi Dench) and Vesper Lynd (Eva Green), this is my favourite Bond film yet. The Power of Three. We're four episodes in, and already the wild theories are bouncing around the interweb: flickering lightbulbs, Christmas, opoosing timelines - and the ever-looming eventuality of the Ponds' departure. After last week's helping of Malcolm Tucker, we're back with the Coalition this week. Peter Mannion & co are stuck in a remote country hotel with Stewart Pearson's 'Thought Camp' session - while back at DOSAC a tragic breaking news puts a spanner in everyone's political agenda. Live coverage from the Marina Bay Street Circuit – one of the shiniest night races on the calender. Red Bull's been famous for dominating this circuit in recent years, but can they hold on to that claim with Alonso/Hamilton on their tails? I used to walk past Chocccywoccydoodah's mother shop in Brighton every week for about three years when I used to live there (in Brighton, not in the cake shop). And I still want that giant Alice in Wonderland Tea Party cake they had displayed in their window, with chocolate spilling out in graceful arcs from upturned teacups, as much as I want the new iPad. Amazingly, this series takes us backstage to meet the team and shows us how they create their gloriously designed cakes. Yum. Downton Abbey came back in full force last week starting off with Mary and Matthew's long-awaited wedding, and the introduction of Shirley MacLaine as Cora's mother. As the household aims to throw a grand party to downplay Downton's financial woes, the devious O'Brien attempts to better the position of nephew Alfred's place in the household, much to Thomas's dismay. The news show is struggling, ratings are plummeting, and Hector and Freddie just can't meet eye to eye on anything. It's up to Bel to reign things in, with a key interview with an Egyptian diplomat in the works despite opposition from the higher ups in the BBC patriarchy, while Freddie discovers a code that entangles him further into Ruth's mysterious death and the possibility of the secret service's involvement.